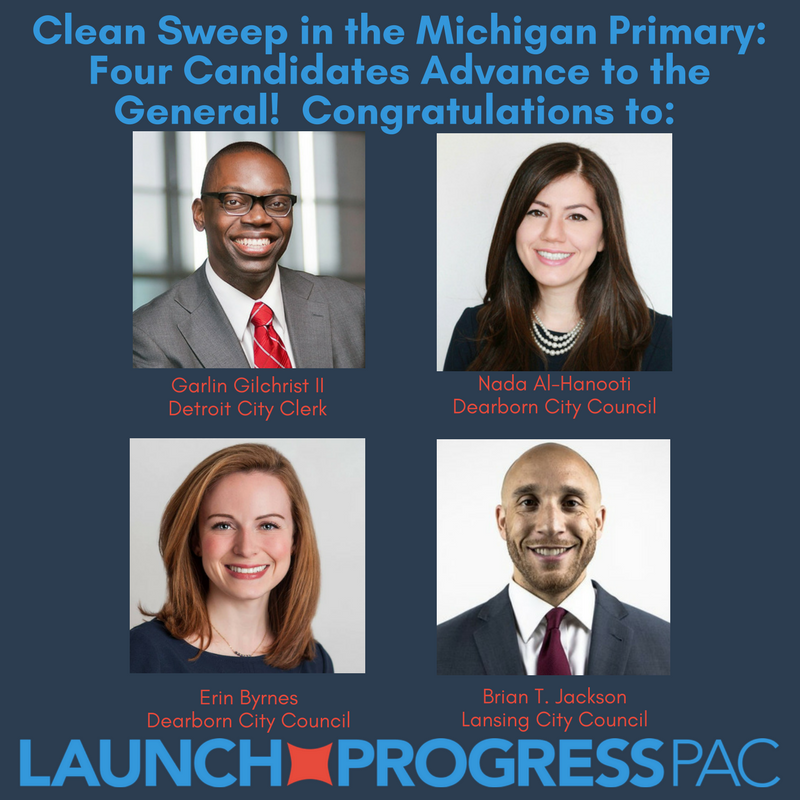 We couldn't be more excited to let you know that all four of LaunchProgress's endorsed Michigan candidates on the ballot yesterday made it through their primaries and will advance to the general election! In Detroit, Garlin Gilchrist pulled off an incredible election, securing his place in the general election this fall. Detroiters have made it clear that they want a clerk that will run fair, accessible elections, and Garlin in that clerk. Up in Lansing, Brian Jackson won first place in his primary election, capturing 43% of the vote in a crowded field of eight candidates. Brian, a criminal defense attorney with deep community roots, will continue to fight for a more just city as he moves on to the general election. Both Nada Al-Hanooti and Erin Byrnes, candidates for Dearborn City Council, advanced through their primary and will appear on the ballot this November. The Dearborn City Council currently only has one woman member. If elected in November, Erin and Nada will help bring parity to the body. You can help us celebrate these wins by sharing our graphic on your social media. You can tag us, too: @LaunchProgress on Twitter and Facebook. We couldn't be more excited about yesterday's results, and while we celebrated last night, we're ready to get back in and keep working hard to get those Ws in November. We have to keep fighting if we want to build a better country for all of our residents.